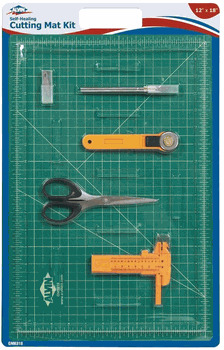 The craft or drafting enthusiast knows the importance of good cutting mats knives and scissors kits. These are all essential tools to any crafting or sewing project. Poor quality knives and scissors become dull quickly and leave the work looking sloppy. Cutting mats sometimes contribute to the problem by dulling the blades. There is a new product on the market called a self-healing cutting mat. These mats are made of a composite material that provides a non-stick, non-marring surface. Most importantly, they do not dull the blade. They also come in a variety of thickness and grid line variations for easy measuring. It is recommended that the mat be at least 3 millimeters as thinner mats tend to be less durable. Both sides are self-healing and will not be affected by cuts and abrasions. They do not give off a glare so you can bring the light as closely as needed to get just the right cut. Many cutting mats come in a kit with knives and scissors. These are known as "hobby knives" and usually come with extra blades. Some people find that cutting materials with a knife is easier and more accurate than with scissors. This is especially true for crafting as many materials are not easily cut with scissors, like thick plastics and foam. When cutting with a knife, it is important to have a cutting mat that is a little bit thicker. 3 millimeters is really the minimum thickness required for a knife; consider obtaining a mat with 4 or 5 millimeters and 3 or more ply. Texture is another key ingredient to the perfect cutting mat. A medium tooth is ideal. If the mat is too smooth, it becomes difficult to make straight cuts. Too coarse of a mat makes arcs and designs difficult to cut. In conclusion, a cutting mat should be self-healing, at least 3 millimeters thick, non-glare, and non-marring to the blade. If all of these criteria are met, you have found the perfect cutting mat!